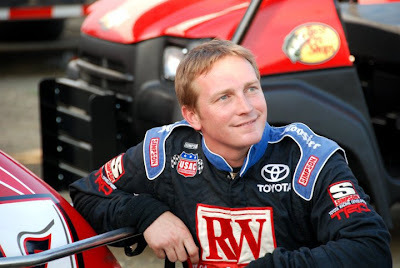 CHARLOTTE, N.C. (January 3, 2013) - It is hard to forget the horrific accident on October 9, 2010 during qualifications for the USAC Silver Crown race at the Terre Haute Action Track where driver Shane Hmiel narrowly escaped death. Since that accident Hmiel’s road to recovery has been nothing short of miraculous and has served as a source of inspiration to many. At first doctors said that he only had a 10% chance to live and that he would never walk or breathe on his own again. They later said that he would never move his fingers again. Doctors then said he would never move his arms again. Then they finally said that he would never move his toes or feet again. However, Hmiel’s hard work and relentless strength to not give up has overcome the odds and did all those things that doctors said he couldn’t do. All of his outstanding recovery would not have been possible without the support, prayers, and donations from his loving family, friends, and fans across the country. Now Hmiel has the opportunity to get back behind the wheel of a racecar with Accessible Racing at Rockingham Speedway on Saturday, January 26, 2013 and is set to overcome another obstacle he was told wouldn’t ever be done. Donations are being accepted now through January 26.